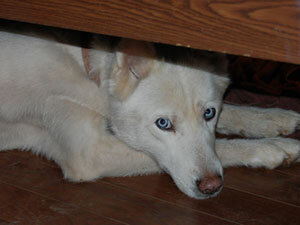 Breezy is a pure white Siberian Husky with baby blue eyes. She is reported as 12 years young, but has the energy of a two year old! Pardon her appearance, she is having a bad hair day. Poor Breezy was given a haircut and lost most of her beautiful fur. No worries ~ it is growing back quickly. Breezy is a very social and sweet girl. She gets along with the other dogs in her foster home and is very affectionate with people. This girl is a definite cuddler and loves to sleep in bed, if allowed. She is housebroken and trustworthy in the house. Breezy’s perfect home will be one where she can hang out and just be the “Queen”. She loves attention and will be fine as an only dog.